One day browsing through the Google Life Photo Archives I discovered a treasure trove of some old photos taken in the USSR sometime before 1956, when Stalin’s portraits were still hanging on many walls. 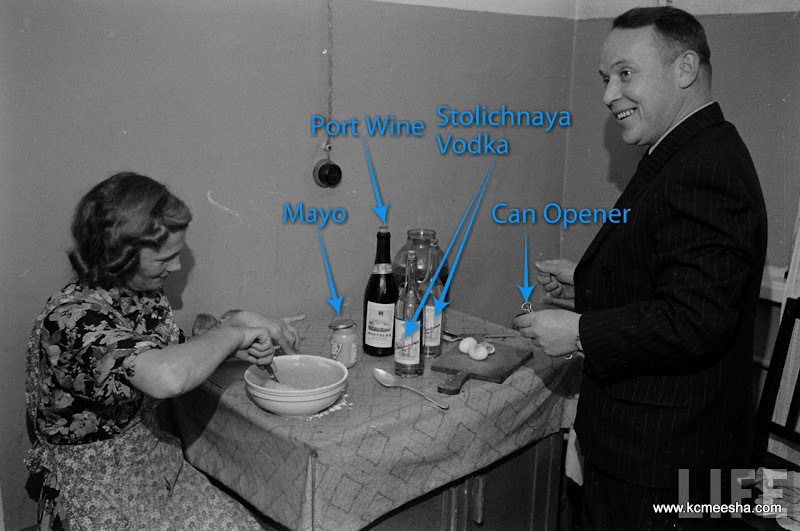 These photos are pretty interesting, as they captured many small details of the Soviet life after the World War II, but even more interesting is the seemingly unlimited access granted to the photographer. Usually foreigners were strictly supervised and allowed access only to pre-approved showpieces of the Soviet achievement. Even in the 1980’s many foreigners were still guided to my school, one of the best in town, where kids met them all dressed up for the occasion and tried to strike a proper English conversation. 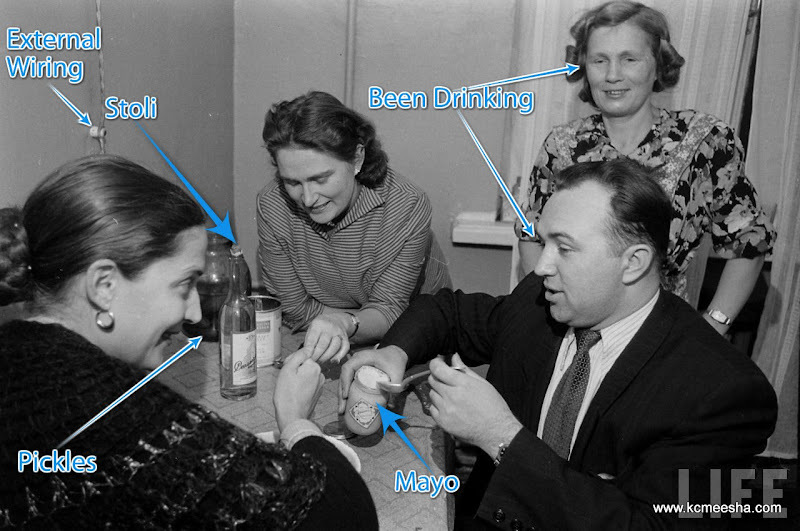 I thought I’d try something different this time: I tagged the photos with my own comments. This is the first experimental batch and then we’ll see how it goes. Let me know if you are interested in seeing more of these with or without comments, since it takes some time and I’d could easily waste it somewhere else. 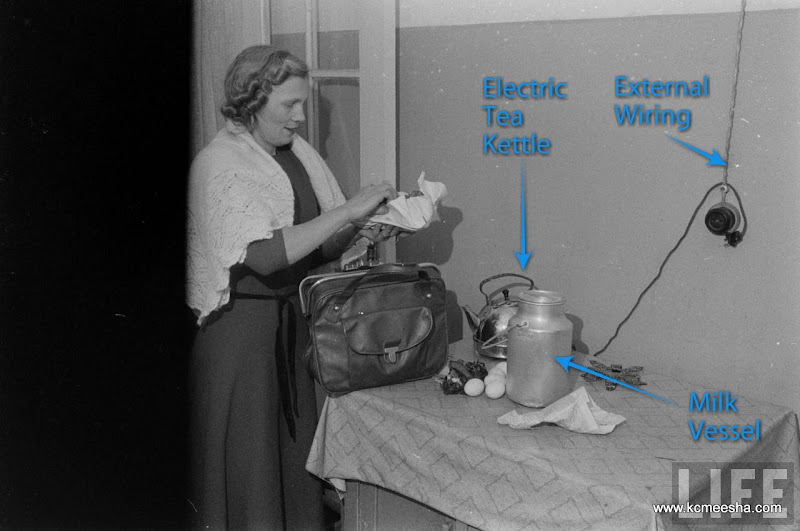 On this photo you will notice a wood-burning stove next to the gas stove that doesn’t seem to work and has another burner standing on top. 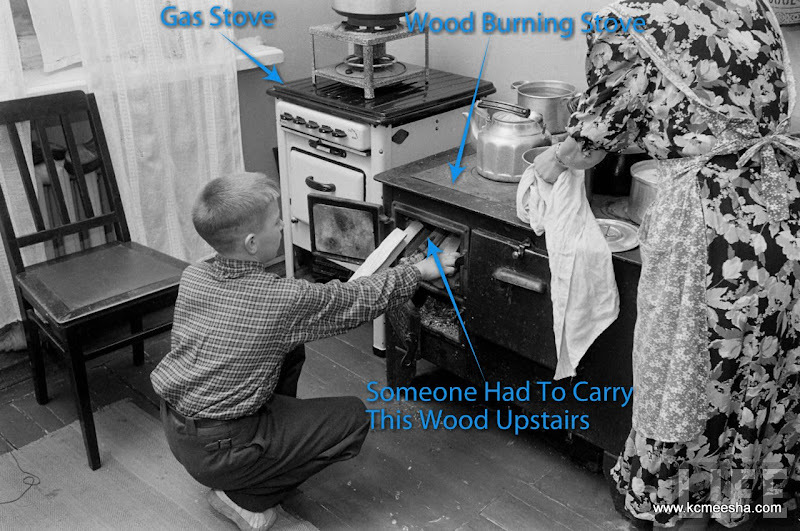 There are some photos showing gas stoves being loaded and moved to it’s probably a time when the whole apartment building was being converted to natural gas. 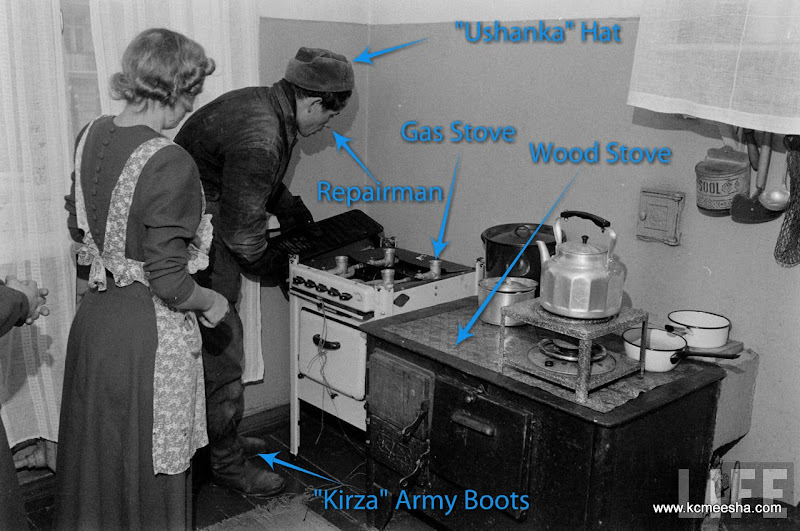 “Ushanka Hat” is explained here and may even get aired out at some Halloween Party; here you will find more information about the “Kirza Army Boots”. Even in my day you still could buy bulk milk and that’s the purpose of the milk vessel below. We owned several and sometimes used it for kvass, other people took them to the beer taps. 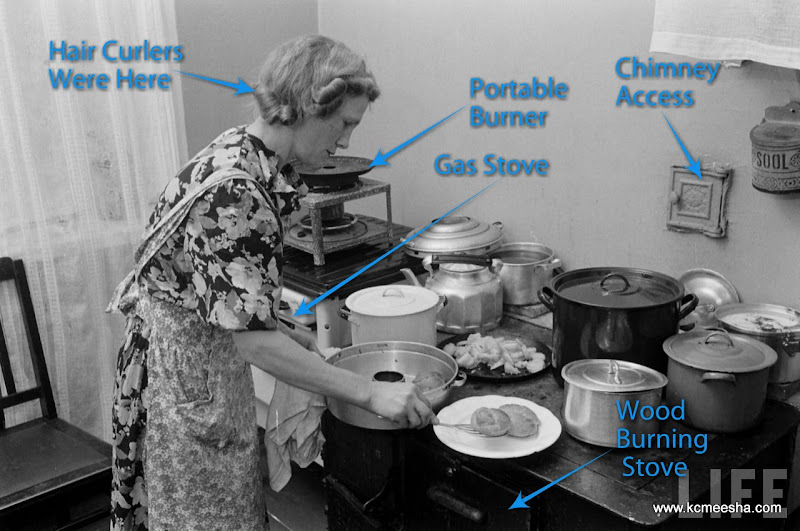 Wood burning water heater below is very familiar to me. We had one and some bath days started with me and my Dad looking for the firewood in the middle of the city. Then my Dad had it converted to the diesel fuel and we had to call the fire department to put it out when we tried it for the first time. This method could only be used on the lucky days when we had running water. 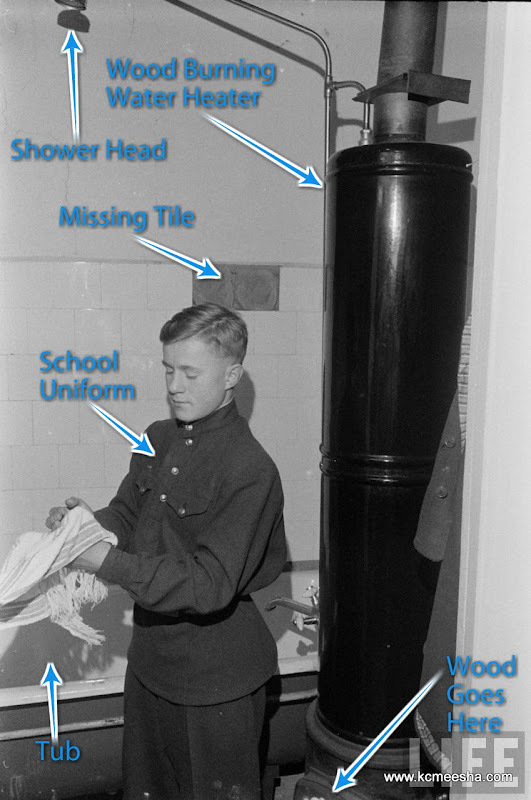 On the unlucky days the tank served as a nice storage for water to flush the toilet.